All winning streaks have to end at some point. The Yankees lost one tonight in extra innings in the Big A after a weird and annoying 11-inning battle. They got close to making it a seven-game winning streak but they blew a lead in the eighth and couldn’t cash in in several scoring opportunities. The Yankees have won some games big lately but when they lose, it’s been mostly of the one-run variety. Annoying, right? Oh well. Games like this happen. Let’s recap and not think about it again. CC Sabathia, who had been on a roll in the previous six starts (0.99 ERA in that stretch, to be exact), started tonight’s game with a similar tone. CC pitched the first three innings scoreless and seemed to be cruising on his way for another good start. Then came the bottom of the fourth. 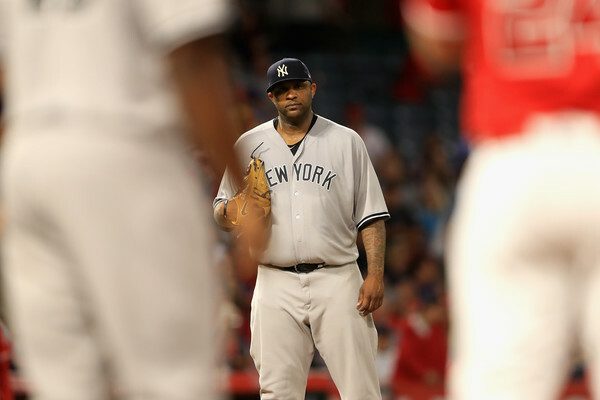 Sabathia struck out Albert Pujols and grounded out Yunel Escobar to get the first two outs. Andrelton Simmons hit a grounder to Didi Gregorius that should have resulted in a very, very routine out and Chris Carter just simply did not catch the ball. It was not like Didi made a difficult throw either. It was a regular “playing catch” throw from the shortstop to first base and Carter simply botched it. The ball went off Carter’s glove and Simmons was able to advance to second. Sabathia attempted to bail his first baseman out but C.J. Cron hit an RBI single to cash in on the Yankee mistake, giving Angels a 1-0 lead. While facing Martin Maldonado, Sabathia felt something in his leg, which turned out to be strained left hamstring. Sanchez threw out C.J. Cron trying to steal second (???) but Sabathia’s night was done. He headed right into the clubhouse after the inning. Welp. Joe Girardi said right after the game he expects Sabathia to head to the disabled list. Not ideal! The best the Yankee fans can hope now is that he’s back healthy without missing a beat. Big guy with a history of lower body problems? No need to be rushed back, so hopefully the Yankees find a replacement plan in the meantime who can do a solid job. Anyways, CC left after four strong innings. The Yankees turned to Giovanny Gallegos for the fifth inning. At the time, it didn’t seem like the most comforting decision for the fans, as Gallegos hasn’t really performed strongly so far this season (7.27 ERA in 7 games prior to tonight’s game). However, Gallegos turned in some good results today. It was his best outing in ML by far: 2.0 IP, 1 H, 0 R, 2 K.
In the meantime, the Yankees tied it up in the bottom of the fifth. With one out, Chase Headley hit a ground-rule double into the right field seats. Chris Carter struck out to ease it up for the Angels, but Brett Gardner hit a single up the middle to tie the game, 1-1. The Yankees took a 2-1 lead in the seventh inning thanks to their usual power suspect, Chase Headley. Wait what? Leading off the seventh, Headley hit a 435-feet solo homer. Again, Chase Headley! Judge hit one 438 feet last night and Headley almost matched that. In terms of impact though, both are quite big. After the Yankees took a 2-1 lead, they went with Adam Warren for the bottom of the seventh. He got into a bit of trouble but wiggled out of it. Simmons reached on an infield single and stole second with one out to give the Angels a chance to tie it up. Maldonado’s groundout sent the runner to third and Scioscia pinch-hit Luis Valbuena for Danny Espinosa. Warren went on to throw a nasty backdoor slider to strike him out looking. Clutch. However, Tyler Clippard didn’t come up as clutch. Coming into the eighth inning as the interim set-up man, Clippard allowed a lead-off homer to Eric Young Jr. for a blown save. He threw a 91 mph fastball that was meant to be located inside and Young turned on it quickly. If you weren’t aware, Eric Young Jr., who only had 1 AB with the Yankees last year, was hitting .878 OPS as Mike Trout’s replacement. How about that? Also, this was the first time a Yankee pitcher had back-to-back blown saves since Matt Thornton in 2014 (May 11-12). Clippard struck out Cameron Maybin and grounded out Kole Calhoun and Pujols to get out of the inning but the damage had been done. It was up to the hitters to score more than two runs for the entire game. The bats tried to get a rally going in the bottom of the eighth. After Didi grounded out, Headley hit his third base hit – a single – of the night to validate his fan favorite status. Carter struck out easily as it was the theme of the night for him. Headley advanced to second on a wild pitch during the Gardner at-bat, setting up a RISP chance with two outs. After a nine-pitch at bat, Gardner hit a hard liner into the outfield… just right at Calhoun. 3 outs. Ugh. It’s been that kind of night for the Yankees. Girardi put in Jonathan Holder in the ninth inning in a 2-2 game because that’s the status of the bullpen right now with Aroldis Chapman on DL. That also went edgy. Holder struck out Escobar, allowed a single to Simmons and got another strikeout from Cron. The next hitter, Martin Maldonado, hit a double into the left field that put two runners on scoring position with two outs. Girardi took out Holder for Chasen Shreve, who induced a flyout from Cliff Pennington to end the frame. The Yankee bats had two runners in scoring position with one out in the top of the eleventh inning and failed to score, because that’s how things have gone for them tonight. Sanchez walked with one out and Didi hit a double to right to put both of them in second and third. Mike Scioscia made some obvious moves here – change the pitcher to one of his best relievers in Keynan Middleton and intentionally walk Headley to fill in the first base and face Chris Carter. I hate to rag on Carter but with the defensive mistake and looking languish in at-bats… it was not his best night. Carter popped up on the very first pitch to make it two outs and Gardner followed it up with another pop out to end the threat. That had to be deflating, at least a bit. Shreve started the bottom of the eleventh by walking Andrelton Simmons. He did retire Cron to a flyout and that ended the night for him. Girardi went with the recently called-up Ben Heller to try to finish the inning. As he faced Maldonado, Simmons stole second to give Angels a RISP chance. Maldonado grounded out to put Simmons on third and Heller followed it up by walking Pennington (sigh). The next hitter, Eric Young Jr. (who else? ), hit a liner off Heller’s buttocks and it trickled towards Didi’s opposite side. Gregorius came up with the ball but it was too late to throw anyone out and the run scored. Angels won, 3-2. Sigh. Quite a fitting way to lose this one. We can pin the loss to the obvious suspects but the big bats going quiet didn’t really help either. The no 3. to 7 hitters (Aaron Judge-Matt Holliday-Starlin Castro- Sanchez-Gregorius) went 1-for-22. Usually, teams lose games like this more handily but the Yankees somehow managed to make it close. On a positive side, Chase Headley went 3-for-4 and was a triple shy from a cycle. Here’s tonight’s box score, updated standings and WPA graph. Because the series is now tied, the game tomorrow (or later today) will be a rubber match. Big Mike Pineda will be on the mound against Matt Shoemaker. Win the series tomorrow. Get the Keurig rolling again, Yankee fans.